The aisleless nave appears early C14, but parts may be older. 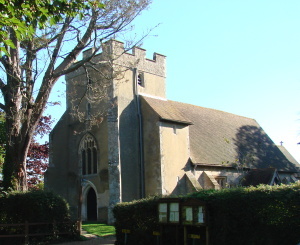 There is evidence that a tower was at least planned then, but the present one is mostly mid-C16 and the chancel was reconstructed in the C19. Despite later alterations, the basic outline of the low, broad aisleless rubble nave could be C12 and Leeney suggested that the plain round-headed doorways might contain C12 stones (p122). A single north west lancet suggests alterations in the C13. Adelaide Tracy in 1851 (I, 78) shows a relatively small chancel, which would be consistent with an early date, though it had a north west lancet, suggesting C13 alterations. The tower arch has responds with three clustered shafts, the inner ones on high bases, which are fairly early C14 and show that a tower was already intended. The much retooled chancel arch also dates from this time. Two chamfered responds start about 3ft 6in above the floor with curling stops and the moulded head emerges without abaci from the upper responds. Below the stops would have been a low wall, probably of stone. The C15 nave windows are renewed. The north one has been moved to make way for the organ, but its original position can be made out and there is a three-light square-headed south west one. The Sharpe Collection drawing (1803) shows similar two-light ones in the east part of the nave, which have been replaced. The existence of the C14 responds is the best evidence that a tower was intended; this might otherwise be doubted, since none of the three contemporary main castellated roof beams is at the west end, where one would have been expected had there been a now vanished belfry, as the VCH suggested (4 p201), intended perhaps as a temporary measure until the tower was built. Alternatively, there was such a beam that went during later repairs. The upwardly braced crownposts of the roof are unusual. Four bequests towards the building of the tower are dated between 1540 and 1546 (SRS 41 p152). The three hollow-chamfers on the head of the tower arch are of this date and sit awkwardly on the C14 responds; the incomplete state of this C14 work is good evidence that this, particularly any tower, was not completed then. Though Elphick dates the bell-frame to the C14 (p228), it could be re-used, possibly from the postulated belfry. The tower is squat and largely rendered, with heavy diagonal buttresses and a disproportionately large square stair-turret to the south that is lower than the parapet. Large buttresses on both sides of the nave may have been added at this time. The moulded west doorway, renewed west window and single bell-openings of the tower are probably on the original lines, as are the battlements and low cap. Taken together, these features indicate strongly a date towards the mid-C16. In the surveys of both 1602 and 1610 the windows are said to have been partly ‘damed up’ or ‘stopped up’ and that of 1636 indicated that they needed ‘mending’ (SRS 98 pp20-21) but there is no record of what might have been done subsequently, though Adelaide Tracy shows what are definitely post-Reformation replacements, particularly in the chancel. A further alteration during this period, the insertion of a west gallery, is revealed by an opening high up near the west end of the south nave that is visible in an engraving in The Gentleman’s Magazine, dated 1803 (1804 Pt II opp. p1101). G M Hills‘s restoration was in two stages. 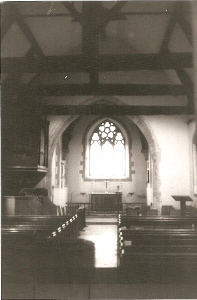 First, in 1863, he reconstructed the chancel with C14 style windows. Though short, it is longer than that shown by Adelaide Tracy and the ‘good pointed style’ was praised in The Ecclesiologist (April 1863). The discovery in 1964 of C14 tiles (see below) suggests, however, that not everything was replaced. 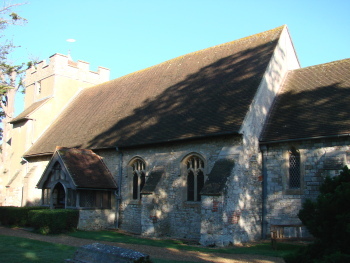 Hills returned in 1882-83 (WSRO Par 23/4/1) to restore the nave and tower, with a new timber south porch and renewed detail. He is said to have removed the roof, but at least the main timbers were put back, though the castellated wallplates are much repaired. Today, the interior is bare, for most fittings were removed, probably about 1964, when the C14 tiles (see below) were found in the chancel beneath C19 ones. Since this time a large north extension has been added. Font: Plain octagonal, 1883 (CDK 1884 pt 2 p154). 1. (South nave, second window) Lavers and Barraud, 1883 (ibid). 2. (East window) M C F Bell, 1978 (signed). It shows the miraculous draught of Fishes and includes Chichester cathedral in the background. Piscina: (South nave wall near chancel arch) C14 with a rounded trefoil-head. Rails: The simple altar rails contain C18 turned balusters, presumably from those recorded by Leeney in 1944 (SAC 84 p123). Tiles: (One is displayed in the nave piscina) These have been dated on heraldic evidence to not later than c1302 (2 p124).